This year the festival’s annual programme of schools and family screenings, will run during Black History Month and this year’s Film Africa Family Day (Sunday 11 November) will take children and parents on an interactive journey of discovery following a special free screening of Thomas and Friends: Big World, Big Adventures! in partnership with Mattel. 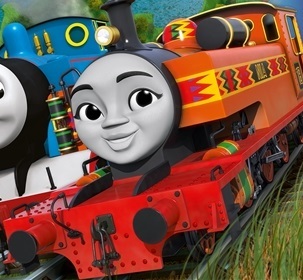 The Royal African Society worked closely with Mattel earlier in 2018 to bring to life the new character of Nia, a steam engine from Kenya! Nia is Thomas’s co-protagonist in this new film and will move on to form part of the steam team living on the imaginary island of Sodor. Film Africa is an annual London film festival celebrating the best African cinema from across the continent and diaspora brought to you by The Royal African Society and runs from the 2nd of November to 11 November.